One of the keys to playing consistent top-drawer pool is having a consistent stance, grip and set up. This is fairly common knowledge. Equally important though is having a consistent eye pattern. Most players rapidly move their eyes all over the place, never really seeing what they are looking at. These rapid, undisciplined eye patterns will cause a player to move their head, jerk the cue back and take their eye off the object ball while stroking. I’m going to suggest an eye pattern for you to try out and work with. It has worked for a lot of players and I hope you adopt it. However, if you don’t like this pattern, develop your own and make sure you practice it and train with it so that you are consistent in your eye patterns. As I approach the table and start to get down on the shot, my eyes are focused on the spot on the table that I want the center of the cue ball to roll through. This spot on the table essentially represents the ghost ball location. Focusing on that precise point locks my head and eyes into the distant target and keeps me on that line as I get down into my shooting position. Next, when my hand hits the table I shift my eyes to the cue ball and intently focus on the predetermined spot I want to hit. I then shift my eyes to where I want the cue ball to go. Once I have the whole shot in my mind, I aim at the cue ball while looking at it. 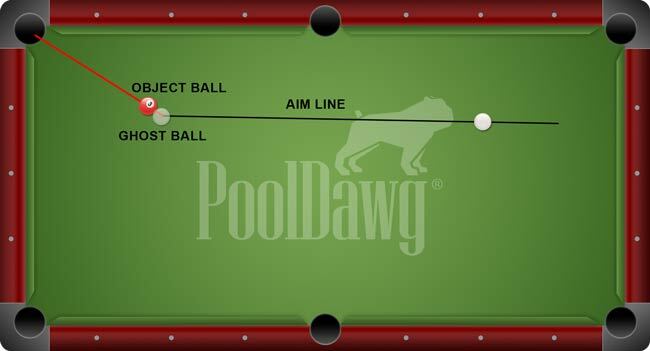 I do this two or three times and then go to my set position, with the tip close to the cue ball and everything stopped. If I like what I am seeing, I shift my eyes to the spot where I want the cue ball to go, slowly pull back my stick, pause, and then follow through. My routine is predictable, consistent and efficient. To learn this specific eye pattern, I practice it 15 or 20 times per day. Consistent, quality repetition is the quickest way to burn in a new habit. With time it will become second nature and you will have developed a pattern for your eye movements that will greatly improve your aiming. The long distance in this shot makes you isolate your eye movements and gives you a chance to sense what you are doing. Remember these steps: focus on the object ball when getting down, focus on cue ball, focus on object ball, aim at cue ball, set, eyes to the target, pause, finish. Be consistent in your eye patterns and your consistency will improve. Play well and see you on the road.